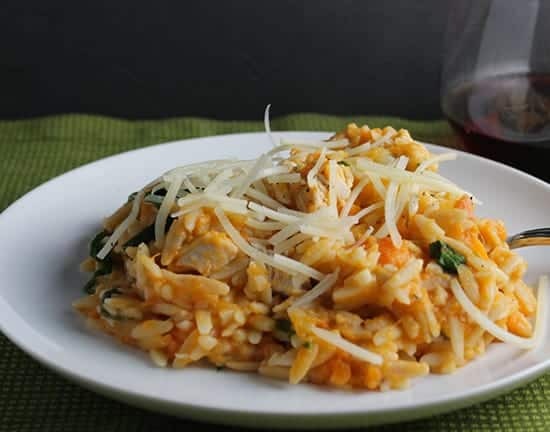 Sweet potatoes combined with savory turkey and cheese in a delicious orzo pasta dish. A wonderfully delicious way to use that leftover turkey! I love the challenge of cooking good, healthy food on a budget. Last year I had a chance to co-host the Budget-Friendly #SundaySupper, and share my Veggie Mac and Cheese–leek tops and all! I’m glad Shelby from Grumpy’s Honeybunch and Caroline from Caroline’s Cooking. are hosting today’s round of Budget-Friendly recipes. With Thanksgiving approaching, I thought a recipe using leftover turkey might be timely. Using up leftovers is certainly a great way to stick within your food budget! Soups and stews are a great way to use leftover turkey, but I wanted to do something different with it this time. So cooked up this Orzo with Leftover Turkey and Sweet Potatoes recipe. I recently made this Garrigue Roasted Turkey Breast, and had a good portion of turkey leftover from that. I started thinking about using the turkey in a casserole, perhaps with sweet potatoes. Then I decided to skip the oven, and simmer some cooked sweet potatoes with garlic, sage and chicken broth. this made a tasty sauce for some orzo and the leftover turkey. 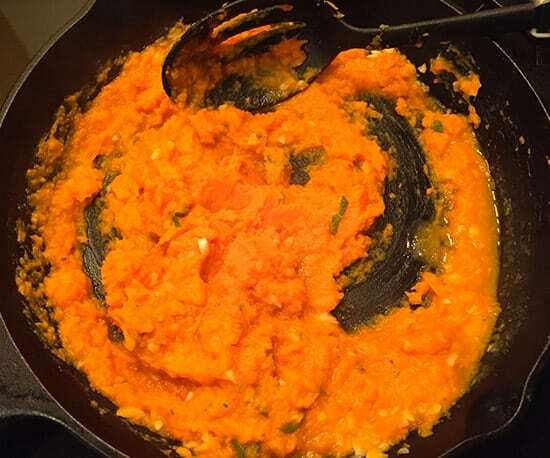 I started by boiling sweet potatoes, but you might well have some leftover sweet potatoes from the Thanksgiving table. In that case, you can skip the first step of this recipe and put those leftover sweet potatoes right into the skillet. Sometimes, leftovers are something to endure as opposed to get excited about eating. 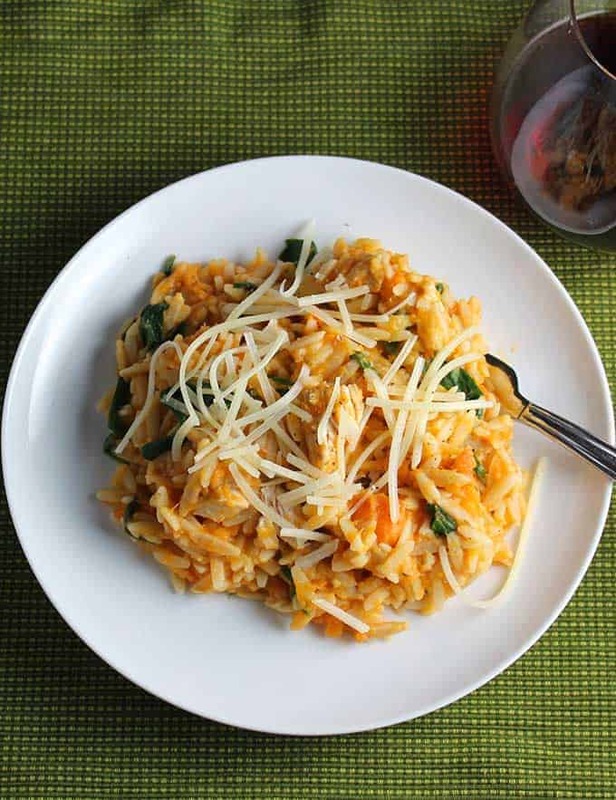 But this Orzo with Leftover Turkey and Sweet Potatoes is going to have you wanting those turkey leftovers! On the plate, you’ve got the sweetness from the potatoes combining with the savoriness of the turkey and sage, and some garlic for more flavor. This is a budget and palate friendly treat! Wine Pairing: This dish pairs perfectly with a Pinot Noir. Maybe you have some leftover from Thanksgiving? Funny, we don’t seem to have issues with leftover pinot here. You just may need to open another bottle! 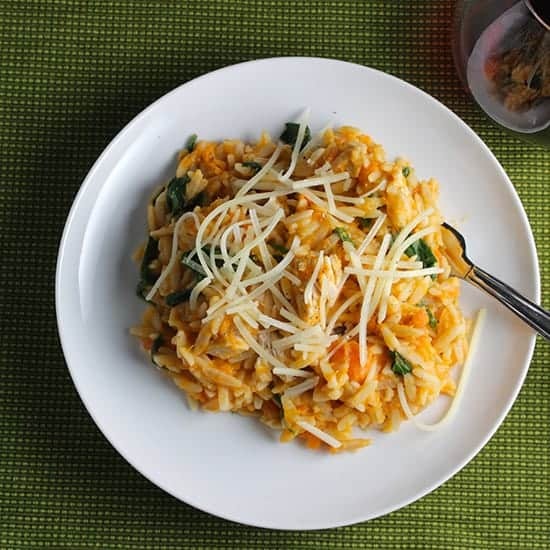 Orzo with Leftover Turkey and Sweet Potatoes is a creative and tasty way to use those leftovers! Boil a pot of water (skip steps 1 & 2 if you have leftover sweet potatoes to use). Add the sweet potatoes, boil for 15 minutes or so, until the potatoes are tender. Drain the potatoes, and rinse with cold water. Set aside. Start boiling water for the orzo, and cook according to package instructions. Add a tablespoon of olive oil to the skillet, and heat on medium. Add the garlic, cook for a minute. Add the cooked potatoes to the skillet along with the chicken broth and sage. Bring the broth to a simmer, stir occasionally with a sturdy spoon. As you stir, gradually break up the potatoes. Let the potatoes simmer for about 10 minutes, and it will gradually break up into a creamy sauce. When most of stock has been absorbed, add the spinach. Then gradually stir in the cream to finish the sauce. Remove from heat and cover to keep warm while the orzo finishes cooking. Drain the orzo when cooked, and toss immediately with the sweet potatoes mixture. Add the turkey, parmesan cheese and slat and pepper to taste. Serve with additional cheese at the table. Enjoy! Be sure to check out all the tasty, budget-friendly recipes! I love what you did here! Orzo is one of my favs. Looks delish! What a yummy way to use up Thanksgiving leftovers! And a beautiful dish to boot! thanks Michelle, it did come out very tasty! A great way to use up leftovers, David! Thanks Cindy, we hate to waste! Thank you. I love repurposing leftovers so that they aren’t recognizable as leftovers. This is a perfect recipe for that. Thanks Wendy, it’s a nice way to keep enjoying the food! Thanks Catherine, you have a great holiday too, Cheers!